Lagos State Governor, Mr Akinwunmi Ambode commitment to provide the State with a functional, robust and sustainable waste management system that would transform the State into the cleanest city in the world, received backup at the weekend with the Launch of Operation Keep Lagos Cleaner by the Itesiwaju Ipinle Eko Vanguard. The state coordinator of the group Seyi Bamigbade said the Governor Ambode dream is always been to positively affect the State as far as waste management is concerned, and that his commitment to follow it through PPP public-private partnership on waste management. Seyi said the launch of the Operation Keep Lagos Cleaner was a voluntary support dream come true, and an evidence of what our group stand for and determined, which you are witness here today in Amuwo Odofin Federal Constituency of Lagos. He advised the Local Councils Executive more efforts to support the new waste management system. The convener of the initiative in Hon. Olawale Ebietomiye said “you can see fantastically looking 10 trucks that would be used for waste management in the Amuwo Odofin Federal Constituency free of charge. This is just a small bit of what we intend to Support the Governor Akinwunmi Ambode policy on the new waste management in the state. “We came together and pulled resources together to support this government in clearing the refuse in Lagos environment. We are not only subsidiary the government, but also sensitizing the people on the proper ways to dispose their refuse and PVC collecting before the closing of the exercise”. Ebietomiye said. “We have provided the community with handbills, provided black nylons. We all know that a dirty environment gives room to cholera and other kinds of diseases. So we want a cleaner Lagos.”. 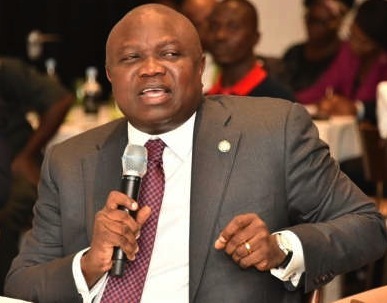 The representative of the Ministry of Environment, Mr. Paul Idowu, a director for LAWMA, said the group for their support for the Governor Akinwunmi Ambode Administration. He said “I am one of the gladdest persons in the world today because a lot of people thought that PPP on PPP public-private partnership on waste management would not be achieved. He stated their satisfaction with the giant strides Visionscape is taking in ensure that the aim is achieved and admonish the staff of the firm to keep up with the aim. The aim of Lagos State and VisionScape is to be the cleanest city in the world by the grace of God, he said. Itesiwaju Ipinle Eko Vanguard initiative was accurately to complement the effort of government on making Lagos clean with what am seeing here today. “what you are doing is assisting government on the cleaner Lagos initiative. This show you’re contributing to what government is having sleepless night about keeping Lagos clean”. Idowu Said. Those presents at the Operation Keep Lagos Cleaner Launch are Hon. Pastor Olu Alagbe Commissioner 1, Lagos State Civil Service Commission, Dr. Oluwafemi Hassan, The Director and Registrar, Lagos State Examination Board, All Progressive Congress Members and Many other voluntary Groups.